Real estate agents have longed relied on the Comparative Market Analysis, or CMA, to help sellers “price their listings” close to a realistic selling price. As member of the MetroTex Association of Realtors, I have access to comparable sales information in a variety of forms. The first step in preparing a CMA is searching the MLS for comparable sold properties. For example, here are sold units for a high-rise property. Because I tour high-rise units when they are listed for sale, I can identify which sold units are most comparable to your own, and by keeping in touch with other high-rise Realtors, I stay on top of the market. By further examining the qualities of each comparable unit I can help you determine the “probable” sales price of your unit, the first step in setting a reasonable “asking price.” Of course, for a comprehensive assessment of the value of your home, a licensed or certified appraiser should be employed. In addition to traditional analyses, I also employ a set of graphical analytics that my Realtor associate, John Pritchett, has developed for my exclusive use. Below are examples of some of the charts I can use to help a seller arrive at just the right listing price. The first two charts deal with supply and demand. 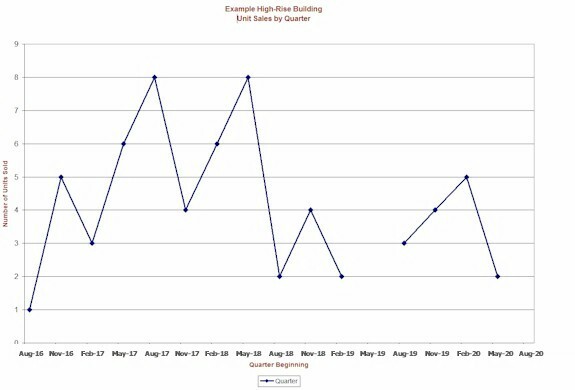 This chart depicts a two-year trend line of supply: number of building units on the market as of the first of the month. 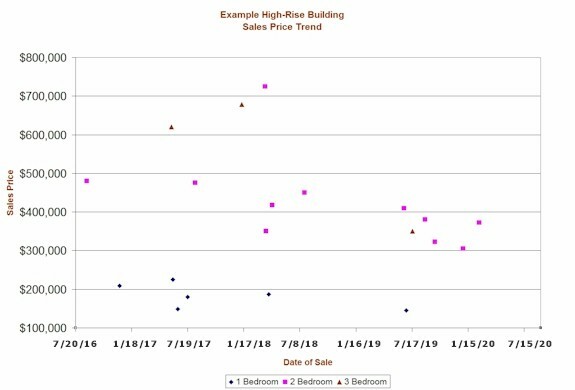 This example chart shows a marked increase of available two-bedrooms units, suggesting a greater pricing challenge for a seller. This chart goes back four years to show number of units sold in each quarter. 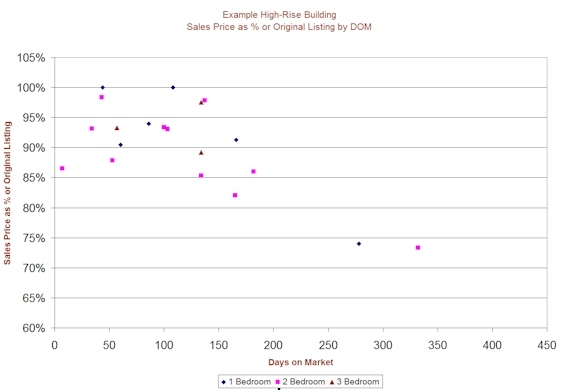 Diminishing sales in the example indicate reduced demand for homes in the building. 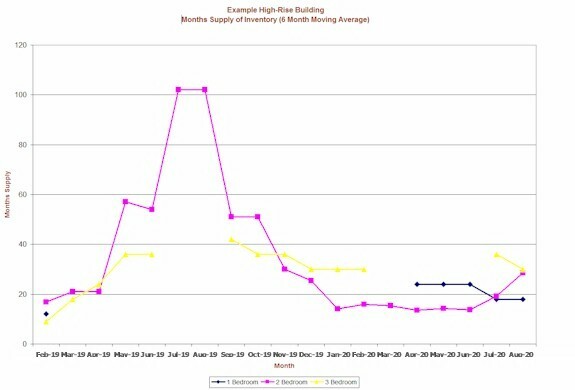 Based on number of units on the market (supply) and a 6-month moving average of sales (demand), we can make a chart depicting the number of months inventory in the building. 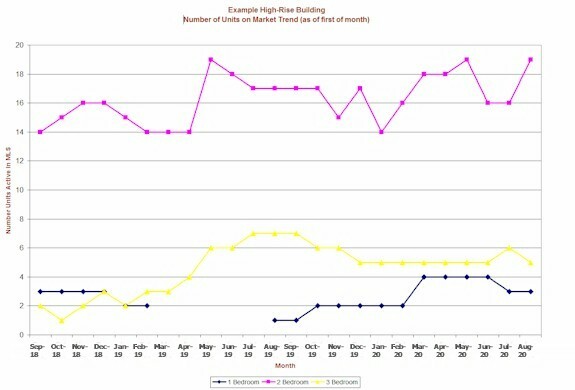 This is a four-year trend of sales prices by number of bedrooms, which is instructive in assessing the direction of prices in the building. In the example below, a slight downward trend on all unit sizes can be identified. When combined with information regarding the overall direction of the economy, real estate in general, the neighborhood specifically, a reasonable asking price can be derived. 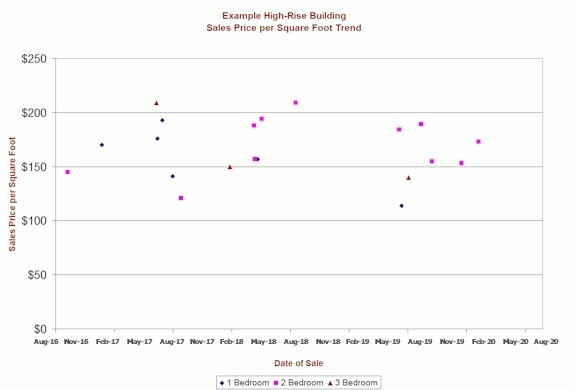 Similar to the previous chart, prices are reduced to a per square foot basis for comparability of all units. Similar to Sales Price by Number of Bedrooms, but distinguishes by floor plan. This can be helpful in identifying floor plans that carry a premium and whether they are holding their value. 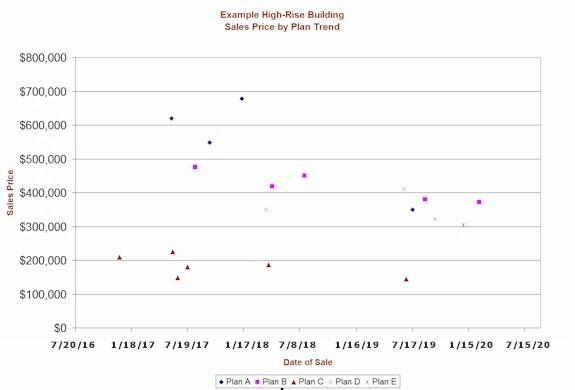 One of my favorite charts, this one reduces all listings to a per square foot basis and depicts not only sold units, but also listings with a contract pending, under option, active, expired and canceled. Although a seller might be familiar with the asking price of active listings and units that have recently come of the market, this chart reveals that selling prices can be much lower. 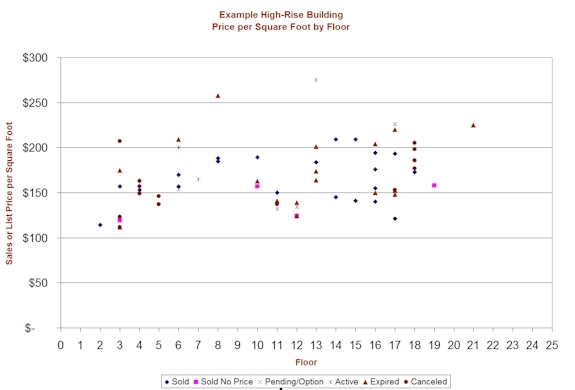 For example, in this chart, the active listings on floors 13 and 17 are substantially above the selling price per square foot of nearby units. Asking prices at which units expire or are canceled essentially represent a rejection by the market and indicate an upper value on such units. This chart has a simple message: the closer you set your asking price to market, the sooner you will sell your unit. Someone is looking for a residence like yours when you put it on the market and if you over-price it, you will lose a ready buyer. Remember that they generally have a Realtor who also knows building values.